Marriage is similar to a business. It’s all about communication, understanding, and partnership. 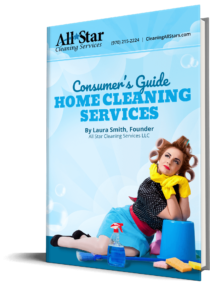 Here are 5 reasons you should consider hiring a cleaning service for your wife. 5. She’s a busy lady. Your wife is the CEO of your household. She is a wife, a mother, a pet caretaker, taxi to ballet and soccer practice, school bake sale baker, checkbook balancer, laundry folder, boo-boo mender, grocery shopper, and cooker of all things delicious. I can guarantee you that the majority of CEOs have an assistant. That doesn’t make them any less important, it just means that they actually have time in the day to get everything done. Your wife is no exception. Just consider it her cleaning assistant! 4. It can save your marriage. We’ve all heard it before. (And some of us have said it before…) “He never helps out around the house! I feel like I’m doing everything!” This is never a fun conversation to have, but it is important to make sure that your wife doesn’t feel that things are unequal. Considering all of the hats that she wears, it’s no wonder she feels that things are less than balanced. There’s no need to fight about housework, just come home and enjoy your spotless abode together. 3. She deserves it! Your wife works hard to make sure that your life runs smoothly. Remember in your single days when you signed up for paperless billing and forgot to pay your electric bill? She’s on top of it. She’s cooking you Pinterest-quality quiches and she always remembers to remind you when it’s your mom’s birthday. Crossing one thing off of her to-do list is the least you could do. 2. You will have more time to spend with each other. With all of the stress of housework gone, your wife will have more time to spend growing together in love and bonding. (Enough of that yucky, mushy stuff.) You’ll also have time to drag her on a romantic date night at Hooters or force her to sit through another Jason Statham movie marathon.